I’m really excited about this post, as there are too many good things all at once! 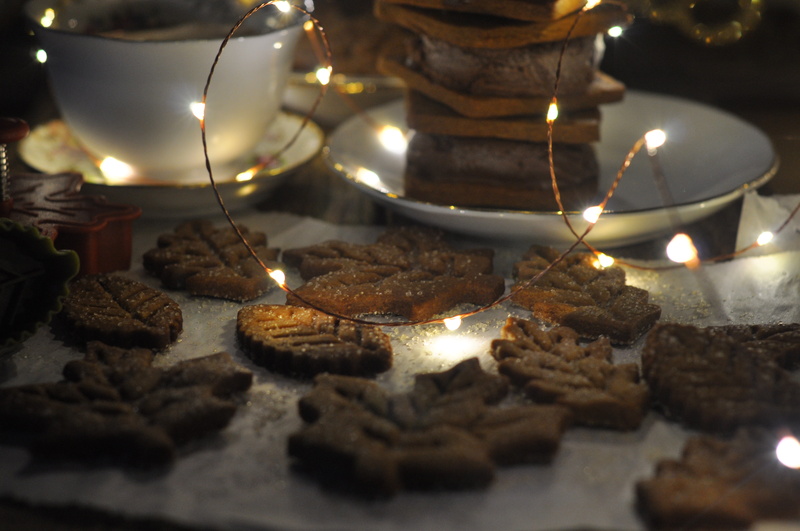 Who doesn’t like cookies this time of year? And it’s never too cold to have ice cream, right? Which is why I combined gingersnap cookies with a decadent double chocolate homemade ice cream. 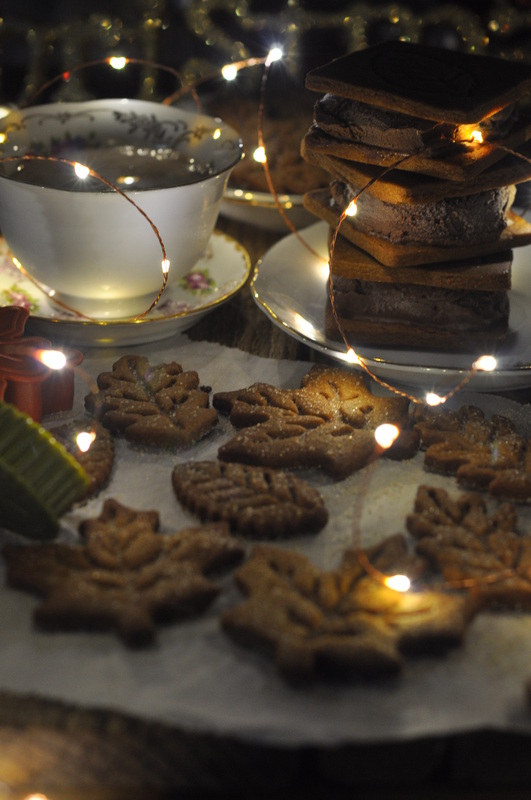 To get into the holiday spirit, I decided to make some gingersnap cookies. You wouldn’t think gingersnaps are the most appetizing cookies, because after all, it’s ginger. 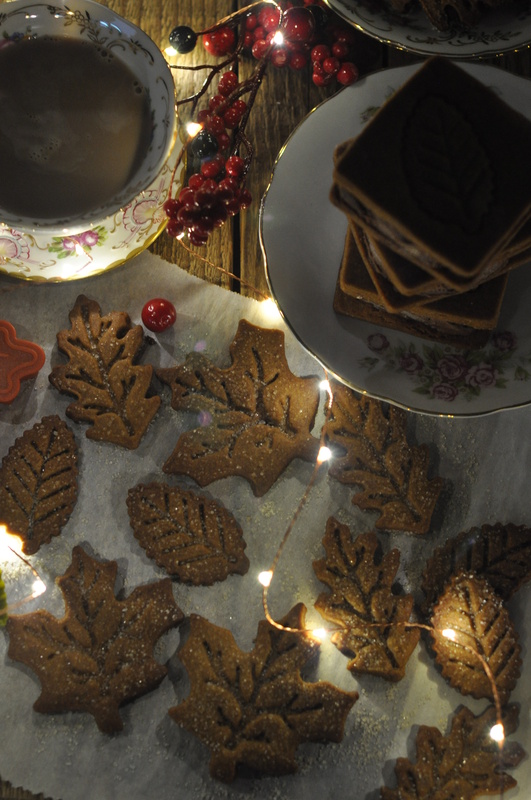 Sure enough, the ginger adds a spicy aftertaste, giving these cookies a little kick. 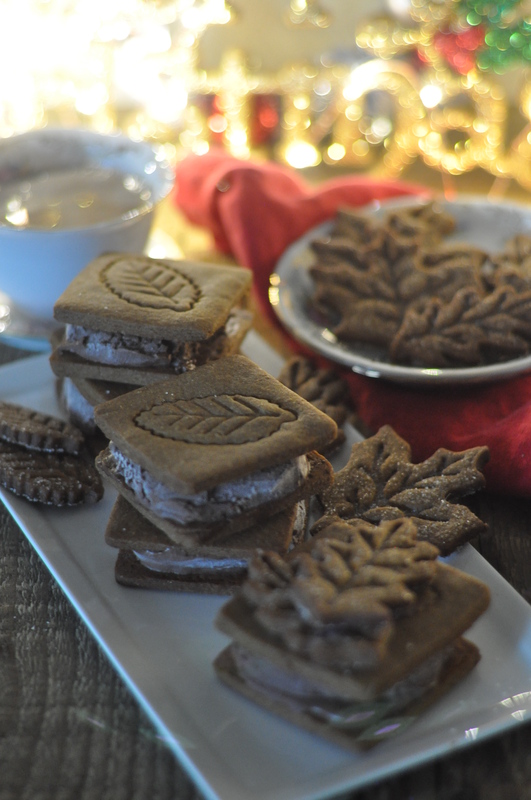 I used my fun leaf cookie cutters that I bought last Christmas season and halfway through cutting the cookies, I had an idea of saving some of the dough to make ice cream sandwiches. 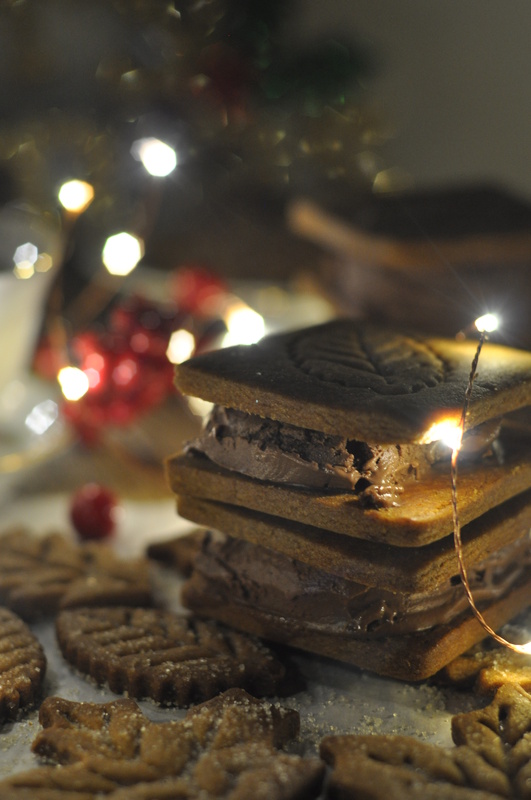 The combination of ginger and chocolate may sound weird, but it’s actually quite tasty. Try it! 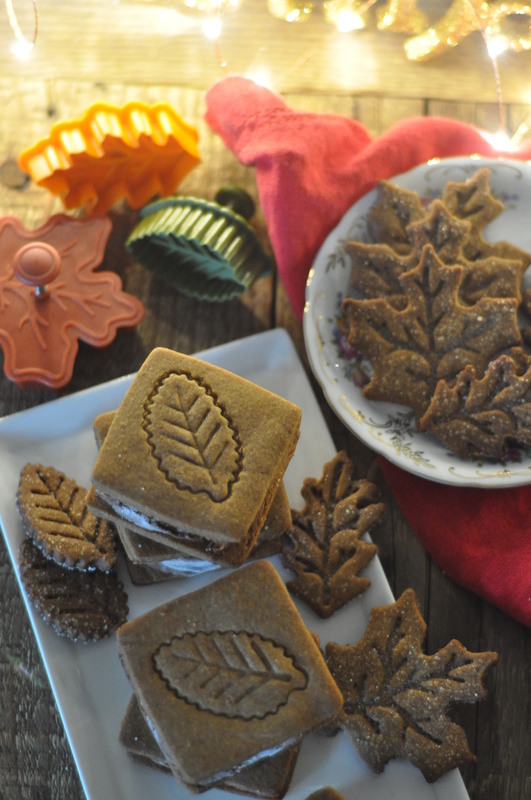 Y= about 50 leaf-shaped cookies and 5-2×2 inch sandwich cookies. Sift flours and all the spices together. Set aside. Beat together the butter and brown sugar until light and fluffy. Add the honey and molasses. Mix to incorporate. Add the dry ingredients in three additions, mixing in between each addition. Form the dough into a disk and wrap with plastic. Refrigerate for at least 30 minutes before rolling. Roll dough out on a floured surface. Use cookie cutter of your choice to cut shapes out. If making ice cream sandwiches, use a square cutter to cut pieces out. 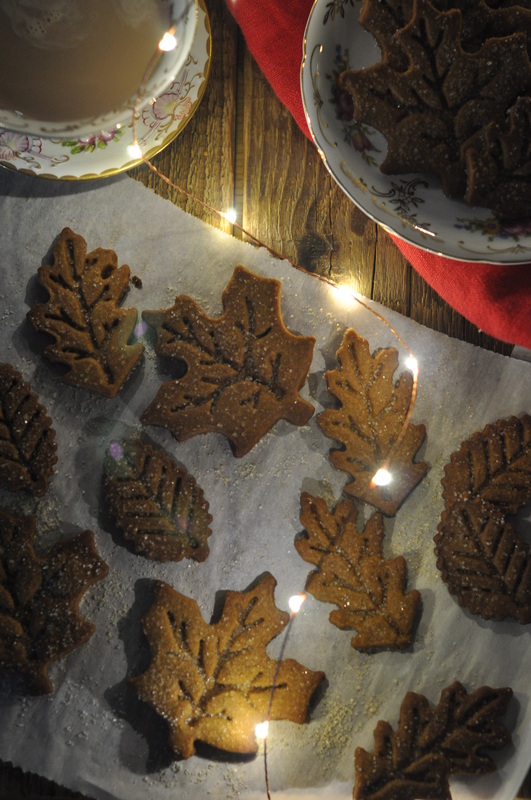 Optional: before baking, sprinkle granulated or cane sugar on cookies. Combine milk and 1 cup of the cream in a saucepan. Heat on medium until bubbles form. In a separate bowl, whisk together the yolks, sugar, cocoa, salt and remaining cream. Place chocolate in a second bowl and set aside. Remove the milk mixture from the heat and whisk ½ cup of the heated mixture into the egg mixture until smooth. Pour the egg-milk mixture back into the saucepan, cook on medium heat, while stirring constantly. Cook until the mixture thickens and coats the back of a wooden spoon. Pour the hot custard over the chocolate and stir to melt. Strain the mixture through a sieve into a clean bowl. Chill the mixture by placing the bowl into an ice bath. Once cooled, press plastic wrap directly on the surface of the custard. Refrigerate overnight. Churn the custard in an ice-cream maker. Place ice cream in a clean container. Allow it to firm up in the freezer. Sandwich ice cream between gingersnap cookies. Wrap ice cream sandwiches individually and place in freezer if saving it for later.